On a stormy Wednesday evening, June 2 of 1909, the last brewery left in the city of Monroe was completely destroyed by fire. The Jacob Roeder Brewery had stood on the corner of Navarre and what was then called La Plaisance Bay Turnpike since 1874 (near where the VFW sits today and – sadly – equidistant from Rob’s and my house). Next to Wahl Brewing Co., it was Monroe’s longest running and most successful brewery. 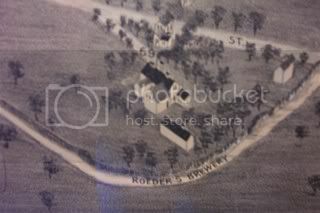 There is even a road named Roeder in Monroe fairly close to the brewery’s location. I could find no information on whether the road was named after the brewer but I like to think it was. The Jacob Roeder Brewery story starts in 1853 when Jacob Roeder immigrated to the U.S. and landed in New York. He had apprenticed as a cooper and brewer back in Germany. He moved to Monroe and settled in the 1st district around 4th and Union Streets. Back then this was considered the German part of town. He first worked as a cooper, possibly making barrels for the other breweries in town. In 1874 Jacob Roeder opened his own brewery. Its original name was J. Roeder and Bro. Brewery. 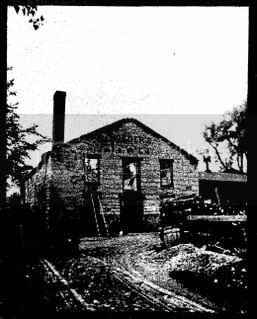 In 1877 the named was changed from that to Jacob Roeder Brewery. The brewery was a stone building facing north. It had two wooden structures on both sides of the plant, one being a artificial ice-house that was installed in 1904 at the cost of $5000. Before that was built the brewery would get its ice directly out of Plum Creek. It may have been a small brewery but it was still able to produce around 1,500 bbls a year – all for local consumption. Not bad considering that the county only had 32 thousand citizens and Wahl was selling 10 thousand bbls already. When Wahl Brewery burnt down in 1905 it left a beer void in the city. Unfortunately Roeder’s was too small of a brewery to supply the demand so in came the competition. 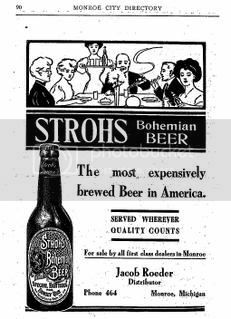 Out of town breweries such as Stroh’s, Buckeye, Springbrook, Goebel and Koppitz-Melzers all started advertising and distributing in Monroe. The success of Wahl had blocked these breweries from getting a strong foot-hold. But with Wahl gone the breweries knew that the beer market in Monroe could be theirs. 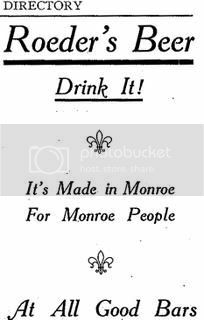 Roeder started to advertise its beer as being “made in Monroe for Monroe People.” They were able to maintain their sales but never grew over 1,500 bbls in a year. The biggest problem facing Roeder was the ASL(anti-saloon league). The ASL was out to close saloons with the eventual goal of prohibition. The idea came from Howard Hyde Pierce. He thought it would be better for prohibitionists to push for wet/dry votes in individual towns and precincts. He was then hired by the newly formed Ohio Anti-Saloon League. The OASL’s tactics of going through the churches and a concentrated attack on one goal was a huge success in Ohio. The rest of the country took notice and the national Anti-Saloon League was formed. The number of both saloons and breweries was diminishing rapidly as 1910 neared. By 1910 half of the counties in Michigan were dry and Monroe actually had a wet/dry vote prior to the fire that destroyed Roeder’s. The good news is that we voted wet. The bad news is that our own hometown brewery wouldn’t be around much longer. The fire started at the west end of the building. It was a stormy night and it is believed that lightening struck the building shortly after 9 o’ clock. the fire spread quickly through the brewery. By the time the Germania Hose Company (the fire department at the time) got to the scene, the main building of the brewery was too far gone to save so they concentrated on the other buildings. The brewery and the artificial ice-house were gone but they were able to save the cellars (along with the stock at the time) and the office. Damage was figured to be between $30 thousand to $35 thousand. Jacob and his son Herman who also worked at the brewery decided not to rebuild and both went to work as agents for Strohs in Monroe. It was probably a good decision to not rebuild since Michigan went dry on May 1st 1918. The years following the fire saw the battle for the right to drink being won by the prohibitionist. Big business interested in having a sober work force helped financially back the prohibition movement. The ASL used propaganda and scare tactics to help sway people over. Crooked owners who ran saloons that were connected to prostitution and con games made it easy for the ASL to create a case against them. Breweries didn’t help the cause either. Since the initial battle ground was basically for cities and counties, the bigger breweries didn’t realize the battle they were in until it was too late. It took 25 years but the ASL had slowly gained enough dry states to push for national prohibition. Anti-German sentiment because of WWI helped put the final nail in the breweries’ coffins. On September 6th 1918 Woodrow Wilson announced that in order to preserve the supply of grain and fuel for the war effort, breweries would close at midnight on December 1st. The war ended on November 11th of that year but still the breweries shut down. On January 16, 1919 Nebraska voted dry giving the required 36 states to pass prohibition as an amendment. The Volstead Act was passed on October 28th 1919 and the 18th amendment went into affect on January 16th 1920. The country would remain dry for the next 13 years. Wow. We had a brewery that we could have walked to. How awesome is that. Kevin – I think it’s time we dig up our life savings and plop a brewery right in the middle of Monroe, and carry on the legacy. 🙂 – (my life savings might get us first months rent.., we might need to have a couple car wash’s). We will definitely need some car washes. Hopefully we won’t need to have a car wash like they did in “Dodgeball”. I don’t look good with my shirt off. Sam Adams did it why not you. maybee you could secretly start brewing @ work after hours. lord nows there would be plenty of water. I’ve been mulling around an idea for the past month or so. It may be silly, it might be interesting. In any case remind me about it when I next see you all.